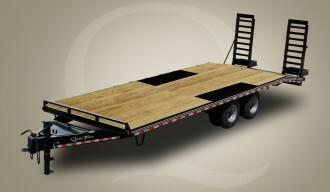 At Quality Trailers, we manufacture a broad line of pintle deckover trailers to fit any need. This includes two different types of trailer. General Duty: Cold form continuous tongue (no notching or heating), rubber mounted sealed beam lighting in enclosed boxes with conventional wiring with gel filled connectors. Professional Grade (in addition to General Duty features): Heavier main frame I-beams and side rails with closer cross member spacing allow a higher GVWR rating, premium radial tires, toolbox with lockable lid (standard on all professional grade models), LED rubber mounted sealed beam lighting in enclosed boxes with sealed modular wiring harness.